Dubbed "the world's smartest LED bulb," the new Philips hue is an iOS application-controlled lightbulb that will be available only in Apple retail stores. Apple's stores will begin carrying the hue on Tuesday, priced at $199 for a starter pack with three bulbs of 600 lumen and a hue bridge to connect the bulbs to a home network. Each bob offers all shades of white and a variety of color, and they use 80 percent less power than a traditional light bulb while providing the equivalent of a 500 watt bulb. A huge introduction pack can expand to up to 50 individual bulbs, and each bulb is priced at $59. With an iOS application, hue allows users to remotely control their home lighting, and personalize settings such as timers. Philips also says that its bulbs are upgradeable and future-proof, as more features can be downloaded in the future. The hue app also features what Philips has called "LightRecipes," which are four pre-programmed lighting settings based on the company's research regarding the biological effects that lighting has on the body. The scenarios adjust bulbs to the optimum shade and brightness of white light to help users relax, read, concentrate or energize. "Philips hue is a game-changer in lighting  a completely new way to experience and interact with light," said Jeroen de Waal, head of marketing and strategy at Philips Lighting. "In the way phones, media and entertainment have been revolutionized by digital technology, now we can also personalize light and enjoy limitless applications. "Philips continues to redefine the possibilities of LED technology, and hue pushes the boundaries even more, not only in offering great light quality, but in how lighting can be digitized and integrated with our world to further simplify and enhance our lives." 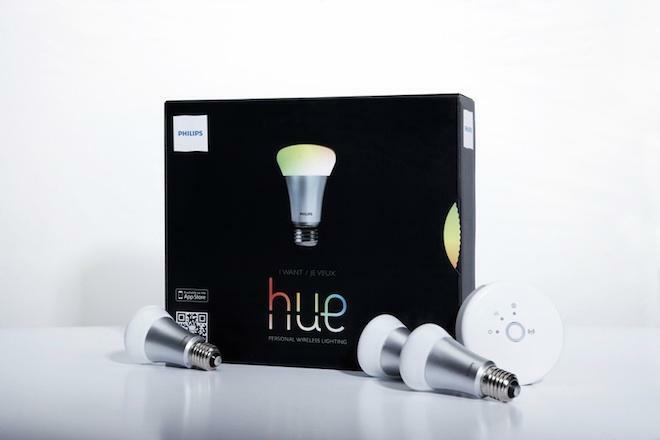 The hue marks yet another home automation device being pushed by Apple in its retail stores. The iPhone maker already carries the Next learning thermostat, which also connects to iPhones via a free application, and aims to reduce users' power bills.